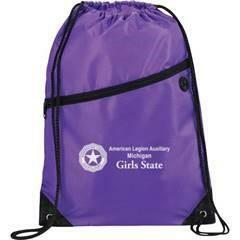 Get an ALA Girls State string backpack to show that you supported a good cause! Comes along with the draw string backpack so you will be styling! Monthly update being emailed out to update you on new projects, sponsors, etc. The American Legion Auxiliary Girls State is an outreach program that helps to change the lives of young women with an intense week of pure leadership, patriotism, and community. The program itself costs about $350 per person and many applicants are unable to attend because they cannot find the sponsors within their community. With our goal of $7,000 and your help, we can help to sponsor 20 young, aspiring leaders from all over the state of Michigan to attend this program. With your donation, we can help to change these young women’s lives for the better and help to cultivate new leaders within our society in the dire re-build of our great country. Our organization is 100% non-profit so your entire donation will be going toward our girls and any donation is greatly appreciated. Check out the rewards that you will be styling in below! !